As I announced in my last post, I have some exciting news to share with you today. This new website is the product of a collaborative effort that involved many talented and dedicated individuals who understand the important role of web communications in furthering the mission of the Church. We chose this day to unveil our new site in honor of St. Patrick, the patron saint of our archdiocese. St. Patrick worked tirelessly to bring the Good News to the Irish people in ways that were accessible to them. Perhaps the most famous example of this is the story of St. Patrick using the shamrock to explain the nature of the Trinity. In that same spirit, we hope and pray that this new web site will help people to better come to know the love of Christ and His Church in Boston. Please take a moment to look over our new site. A happy and blessed St. Patrick’s Day to you all! Le recordamos con muchisimo carino en la isla de Santa Cruz. Gracias a su pagina en internet pude ver cuando el Padre Martinez fue nombrado Obispo en el Paraguay y leer la nota escrita por el Padre Jose G. Herrera. Ustedes tres dejaron huellas imborrables de como ser un buen cristiano por el ejemplo que nos daban con su amor a la iglesia y a todos los parroquianos. Le doy gracias a Dios porque fueron ustedes y tantos otros buenos sacerdotes en la iglesia de San Jose los que ayudaron a mis dos hijos en su formacion cristiana. Seguimos aqui a sus ordenes. Quizas algun dia le veamos bajar nuevamente del Sea Plane con sus sandalias de cuero y con una hermosa sonrisa. Espero en DIOS, usted goze de buena salud para seguir trabajando con su pueblo, ya que las diferentes comunidades de Boston necesitamos su apoyo. En ocasiones anteriores, he escrito para comentar la necesidad de tener acceso a sus comentarios o noticias de la Iglesia de Boston en Español, ya sea en su blog o lo mejor sería en el Pilot, una sección es Español. Las comunidades de habla hispana en Boston ha crecido mucho, y muchos vemos la necesidad de que la Iglesia use sus medios de comunicación escrita tanto en papel como en la internet, para comunicarse con las diferentes parroquias. From my blog to yours, thankyou for your inspirational words and weekly postings to the Archdiocese and the world! The above link awards your blog a PREMIO DARDOS. 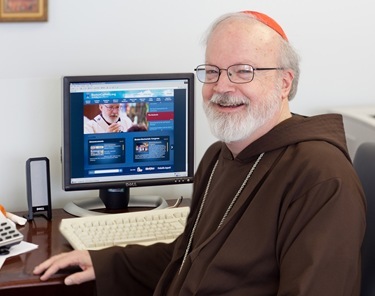 Thanks, Cardinal Sean, for adding your voice to the blogosphere! Congratuations on the new website–Wonderful! WOW St. Patrick’s Day in Rome must of been so much fun!! I have always wanted to go to Rome and celebrate a holiday there, just to see what it is like!!! I am sure your week was busy!!! Thank you so much for your blog Cardinal Sean!!!! I am glad you have set up a new blog. My concern is the Logo that was chosen for the new health insurance about to be part of Catholic hospitals in Boston. The Logo smacks of Communism. This was disturbing. I have lived over seas and living close to Iraqui which was run like a communist country under Hussian. Had friends who traveled through communist countries and found no freedom, even their luggage was rummaged while they were eating. Please pray before you take something that is not of our Catholic faith. In the end, it is God that we have to face and there will not one else to blame for our free will decisions. This is an absolutely beautiful, dynamic and wonderfully designed site! It is visually stunning and uses the integrated media which is at the service of our mission so well! My prayers are with you dear Cardinal as you continue to serve the Lord and His Church. This is no easy time to pastor the Church and you are bearing the burden and carrying the Cross so very well. You may recall, I was born in Dorchester. I grew up there and in Sharon. My heart is still in Boston in many respects and I pray that the Lord continues His vital work of the New Evangelization in the Church and for the whole New Engalnd area. You, your priests, deacons and lay faithful are in my prayers. Congratulations Cardinal Sean. I’m happy to see your smiling face on your new website. Happy Saint Joseph Day ! WOW, I don’t mean to make you sound like a legendry figure, but my mother use to tell me a story about how she met you at the Tulsa International Airport in the 1970’s, (I believe you were on your way to speaking at ORU or some university) I didn’t think she was lying exactly, but to actually see you are a person is amazing, she has followed your life through the church, and I believe you had a profound impact on her life. I’m pleased to have found you, and my mother and I wish you many good years of health and prosperity and praise you for your excellent work in the church. Congrats on the new website. It looks great! There’s just one major problem with it. There’s no link, or at least readily accessible link, regarding vocations. As grave as the shortage of priests is, and in light of the Holy Father’s announcement of a year for priests, this really ought to be top priority! Feliz dia de San Patricio!!! y también felicidades por la nueva pagina. Esta muy interesante. Cardinal Sean – the website looks fantastic! Increasing web presence is especially important in today’s world and it’s good to see the RCAB is keeping up. Good work! Querido Padre Sean, Fabulous website! Congratulations! We were praying for you very especially today at Mass for Saint Patrick. As the Irish prayer said: May Christ be with you, Christ within you, Christ behind you, Christ before you, Christ beside you, Christ to win you, Christ to comfort and restore you, Christ beneath you, Christ above you, Christ in quiet, Christ in danger, Christ in the hearts of all that love you, Christ in mouth of friend and stranger. Muchos cariños siempre. Congratulations on the successful launch of the Archdiocese of Boston’s new website. The site is very well designed, has relevant and timely information and is easy to navigate. May BostonCatholic.org continue to spread the good news of Jesus Christ to the people of Boston and to our greater Catholic Community. Good looking website…I love the “being Catholic” with the widget for finding one’s parish! My family and I pray you do not allow this travesty to proceed.